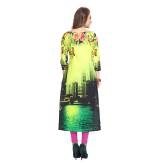 Shun The Shackles Of Bygone Fashion Wearing This Kurti By Anuswara. Look Classy And Stylish In This Piece And Revel In The Comfort Of The Soft Cotton Fabric. This Attractive Kurti Will Surely Fetch You Compliments For Your Rich Sense Of Style.